Roger Federer has been knocked out of the US Open in the fourth round by world number 55 John Millman. The 37-year-old Swiss had prioritised winning a sixth title at Flushing Meadows but was beaten 3-6 7-5 7-6 (9-7) 7-6 (7-3) in three hours 35 minutes. It is the first time Federer has lost to a player ranked outside of the top 50 at the US Open. Australian Millman will play two-time champion Novak Djokovic in his first Grand Slam quarter-final on Wednesday. Millman, 29, is the only unseeded player left in the last eight of the men's draw. "I'm probably in a little bit of disbelief," said Millman. "I have so much respect for Roger and everything he's done for the game. He's been a hero of mine." Second seed Federer, bidding for a record-extending 21st Grand Slam, missed set points in the second and third sets before capitulating in the fourth-set tie-break. Millman had never beaten a top-10 player before but suddenly found himself with five match points against arguably the greatest male player of all-time. After Federer rallied to save two of the them, Millman completed victory at almost 01:00 local time in a humid New York when the out-of-sorts Swiss lumped a forehand long. It was Federer's first defeat in 41 matches at the US Open against a player ranked outside the top 50. Federer, usually so calm and collected, was flustered throughout most of the match as he complained about crowd noise and became unusually vocal during some tense moments. "It was very hot and one of those nights where I felt I couldn't get air," he said. "I just struggled in the conditions and it was one of the first times it has happened to me. "You just keep sweating and lose energy. At some point I was just happy the match was over." After not dropping a set in his opening three matches, Federer looked on his way to another controlled victory when he eased to the opener in 33 minutes. However, the warning signs were clear from the start of the second set. Federer's reliable serve has been the bedrock of his game over the years but an uncharacteristically erratic display allowed Millman to fight back and earn a memorable win. The world number two produced a contender for one of the ugliest service games of his career, unable to find his timing as he landed just six of his 24 first serves in a 14-minute second game. He somehow managed to hold after fighting off seven break points, before breaking Millman's serve himself to lead 3-2. But, with his first serve percentage down at 31%, Federer still looked uncomfortable. He blew two set points when serving at 5-4 and a double fault at break point gifted Millman the game and the Australian broke again as he won four games in a row to level the match. Willed on by a supportive crowd on Arthur Ashe Stadium, Federer managed to steady his service game in a tight third set and had set point but Millman hit an outrageous 100mph second serve down the middle. The Australian wasted one of his own with a long return as Federer battled to stay in the set, only to take his second chance and leave Federer facing an uphill task. 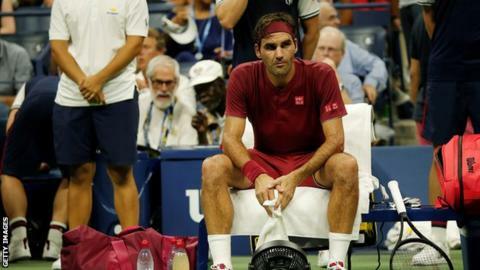 Federer came back from two sets to one against Russian veteran Mikhail Youzhny at Flushing Meadows last year and briefly looked as though he could do the same when he broke in the sixth game of the fourth set. But he handed the advantage straight back as Millman continued to keep his nerve. Federer's tension was clear in both his game and his demeanour during a stuffy night in New York. The five-time champion was continuing to toil with his groundstrokes, often opting to use drop shots which were frequently punished by Millman. Federer hit 35 dropshots throughout the match - more than he had previously hit in the whole tournament - as he lost belief from the baseline. And, in turn, his increased perspiration and some signs of irritation illustrated how tough he was finding it to turn the match around. A brief rally came when he trailed 30-0 at 5-5, finding his first serve with three in a row to fight back and hold. But back-to-back double faults - his ninth and 10th of the match - gave Millman a 4-1 lead in the tie-breaker which he would not relinquish. Millman played an outstanding match, and showed great class at its climax with his understated celebration. Federer had little confidence in his game, misfired regularly on serve, and frequently resorted to the drop shot to try and dig himself out of trouble. Let's not forget he will remain the world number two at the conclusion of these championships, but the match conjured up memories of his fourth round defeat by Tommy Robredo here in New York in 2013. Then, Federer had back problems, and was five years younger. I thought he was unlikely to win another Grand Slam and I am so delighted he proved me wrong three and a half years later with his astonishing victory at the 2017 Australian Open, which paved the way to two further Grand Slam triumphs. I do not want to make the same mistake again. When refreshed at the start of the year in Melbourne, or on the grass of SW19 ... who knows? But bear in mind that Ken Rosewall is the only man in the Open Era to have won a Grand Slam after celebrating his 37th birthday. In this phenomenal era, and over five sets in the sapping humidity of New York, we should not be at all surprised Federer has fallen short. But we are allowed to feel a little glum.